I'm not one to write on politics. I usually steer clear, mainly because I think its difficult to weigh all of the evidence being presented, not just by the Politicians, but also by the masses. To me, there are just too many opinions being thrown around. However, this morning I was listening to the Brad and Brit show on FM 101.1 in Raleigh, and couldn't help but blog about it. 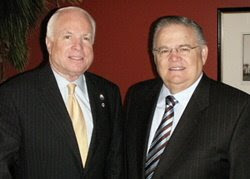 As many of you know, recently John McCain proudly accepted the endorsement of Reverend John Hagee, Pastor of Cornerstone Church in San Antonio, Texas. Well, in the political arena, this is somewhat of a ballsy move. Mainly because its pretty obvious that McCain is doing this to gain the support of the conservative Christian right. But more so because of the fact that Hagee has a some well known controversial doctrine he upholds. While Hagee is a well known Christian Zionist, some have considered his interpretations a little tough to swallow. Hagee has gone on record asserting that God sent Hitler to persecute the Jews through the Holocaust in order to get them back to the Promise Land, which Hagee believes is a direct fulfillment of Jeremiah 16:15. The hosts were taking calls from people with the intention of getting feedback on whether they thought this was as damaging to McCain's campaign as was Obama's relationship with Reverend Wright. As you can imagine, however, the callers were not calling in to comment on that. Rather they were calling in to comment on Hagee's interpretation, some to defend it, some to criticize it. From the 20 minutes I listened to, three people called in to offer an explanation to Hagee's analysis. It was clear that these were Christian people who sought to defend the sovereignty of God. They weren't agreeing with Hagee's overall construal but were saying that in accordance with what the Bible says about God's previous dealings, this would not be a far fetched interpretation. Well, Brad and Britt were not buying it. They expressed their how appalling it would be for God to deliberately "permit" the Holocaust, to allow millions of Jews to be killed just to get them back to Israel. With respect to Hagee's interpretation, I think its very difficult to substantiate. Can this fit within the framework of the overall drama of redemption, I don't see why not. In Isaiah 10 God did use Assyria as the rod of his anger against rebellious Israel. However I find it a very daunting task to attempt to authenticate or verify this method of modern cultural/biblical exegesis. Those biblical authors who did so in the past were clearly prophets of God. And I dont' think Hagee considers himself among those. As far as McCain's campaign being tainted, politically speaking I think they might be right. I don't think that this was the best move particularly because of the controversy that has surrounded Hagee in the past. Do I think its as bad as Obama's affiliation with Reverend Wright, no I do not. Mainly because Hagee is a supporter of this country and of Israel. Wright has consistently and constantly ripped this country for its oppression of the black community, among other anti-patriotic comments. Remember, I'm speaking politically here, not my personal opinion on which candidate is the best. To me, voting for the president is choosing between the lesser of two evils. Needless to say, this is not a conversation that will be limited to simply this radio station, or this blog for that matter. I'm sure you'll read much more about this in the coming days on Yahoo, CNN, or MSNBC. I thought pastors endorsed politicians, not vice versa. What exactly does it mean for a pastor when a politician endorses him? Is that like, "it's cool for moderate republicans to go to church here?" Seems weird. I guess its more of endorsing the endorsement of Hagee. Either way its a tough move. Especially since Hagee also calls the Roman Catholic Church "The Great Whore." Ouch. Looks like Obama is getting the Catholic vote. i think the hagee vs. wright comparison is a bit shallow here. it's also difficult to characterize reverend wright as unpatriotic and, therefore, "worse" than hagee. he did serve in military which indicates more of a willingness to sacrifice himself FOR his country. i personally think that much of what wright has been concerned about is largely understandable. does he communicate his concerns in the best way? no, but that doesn't mean his larger points are invalid. it's very easy for white America to forget that there is still a deep and profound wound that our african american brothers and sisters carry with them. there is anger, resentment, bewilderment....especially in rev. wrights generation. those feelings of anger are not invalid. does that excuse hateful speech, of course not, but it gives is a context in which we can see those feelings as understandable. and in the end, i think politically, this issue will be a wash. both mccain and obama know they each have nothing to gain by beating these dead horses. they both have their "questionable" religious affiliations so neither will be overly eager to hit the other with the same weakness. thanks for your comment on this! is it your assumption that its "anti-patriotic" to critique america? i, for one, expect more for us. P3, no it is not my assumption. But I will say in the manner which Rev Wright has spoken about America, in contrast with Hagee's comments, Wright's will be seen (and has been seen) as anti-patriotic. Therefore I think he will have more of an impact on Obama's campaign than will Hagee on McCain's. let's say you're right and it does impact Obama more, it's still not going to be a pivotal issue. Obama's left the church and the CBS poll has him at 6 point ahead of McCain. Give it a few weeks to allow his nomination to sink in and the numbers will be even more favorable for Obama. McCain will be a long shot. You may be right Zack. Its always difficult to determine how something like this will impact a candidate. Seems now like it may dissolve in favor of Obama. Guess we'll have to wait to see if McCain will be a long shot. I think that will depend on many factors; one being if Obama plans to take Hillary as VP. I make no claim to be a political expert, but I actually don't think Obama's choice for VP is going to be that big of factor for the campaign; in terms of McCain's chances, that is. I think Obama as president is basically a sure thing. The republicans have a lame duck nominee with McCain. i would truly be shocked if he gives HRC the VP spot. (I personally would like to see Jim Webb of VA as his pick). At best, I think HRC will be offered a cabinet position maybe an elevated health care czar type role. you may be right though, it's a long way till november and right now it's wise to count anyone out. you guys are doing a good job with the blog! where's Matt?